The mortgage bubble resulted in massive housing vacancies, hollowing out large parts of Cleveland and several inner ring suburbs. But there are opportunities and developments that offer Northeast Ohio a way forward that re-invigorates our region and adopts green-friendly reuse and redevelopment. Jim Rokakis will offer a set of regional prescriptions to heal our land and waters and empower government and citizens to grow our economic future. Elected as the youngest member of Cleveland City Council at 22, Jim Rokakis' passion for neighborhood revitalization started a young age. During his 19-year role on council, he witnessed the development of Cleveland's downtown, the creation of the Cleveland Housing Court, and served as as chairman on the Finance Committee for the last seven years of his council tenure. 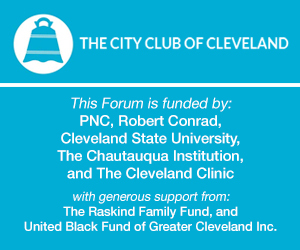 As county treasurer, and as the Cuyahoga County Land Reutilization Corporation's first chairman, Rokakis has long held an interest in serving Cleveland's neighborhoods. In 2007 he received the NeighborWorks America Local Government Service Award, the Leadership in Social Justice Award from Greater Cleveland Community Shares and was named the County Leader of the Year by American City and County Magazine. Rokakis earned his undergraduate degree at Oberlin College and his Juris Doctorate degree from Cleveland-Marshall School of Law.